There is no way to do justice to the myriad of ways in which the stories of MEANWHILE, written and conceived by Jason Shiga, take shape. 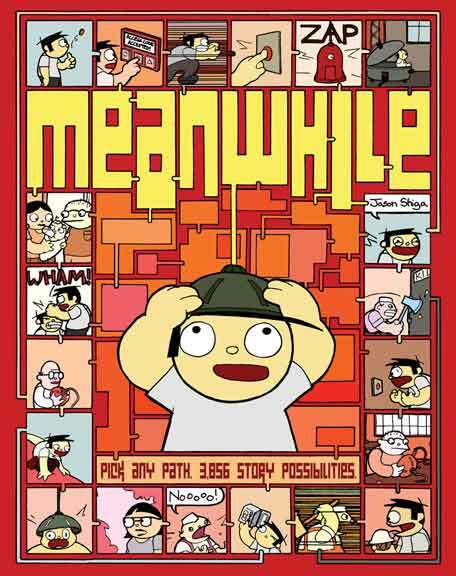 In fact, the book touts that there are actually 3,856 different possibilities of the narrative. I'll take Shiga's word for it but the way the stories branch off in various and unexpected ways is a pretty satisfying adventure for any reader. 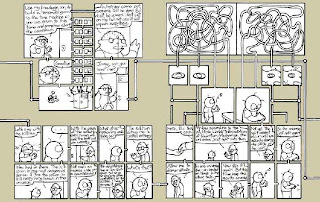 The comic is very nontraditional in that you use your finger to follow the story thread to various points, and then make decisions about the direction of the story of the main character, Jimmy, and follow the colored tubes off to tabs on other pages, weaving your way in and out of parallel storylines. Got that? This is the explanation depicted in the book. What emerges from the experience is an intensive tangle of narratives about a doomsday device, time travels and the reading of the minds of others, and all of it begins with a simple task before the main character (and the reader): vanilla ice cream or chocolate? Take my advice. Go for the chocolate. You won't be disappointed. Shiga does such an impressive job with the layout and design of this book that the possibilities can overwhelm the colorful art at times. This is not a bad thing, per se, but it is very different from many comics. 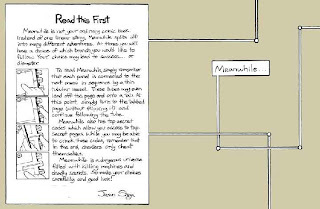 You look at a page, with its crisscrossing colored tubes, and sometimes you are reading it from right to left, or bottom to top, and you barely notice how cute Jimmy, the main character, can be or how detailed the backgrounds can be. You can also view an image of Shiga with his story on posted notes on a wall as a comic matrix. 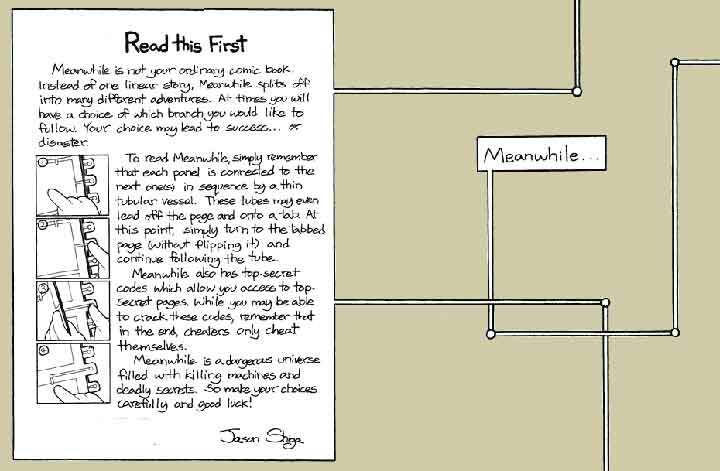 You have to look for it, but there is a note on the index page in which Shiga explains how the book evolved from seven detailed flowcharts, which were later fed into a computer program to help come up with a layout for a book format. Unlike the book's website built on hyperlinks, here in the paper book format, Shiga uses colored tubes as pathways and your finger to track the progress of the story (or one of the stories). For young writers, it might be possible to narrow the scope of but still create a single flowchart for a story that has three to four different possibilities, and then design what that would look like, using the Choose Your Own Ending books as a model. 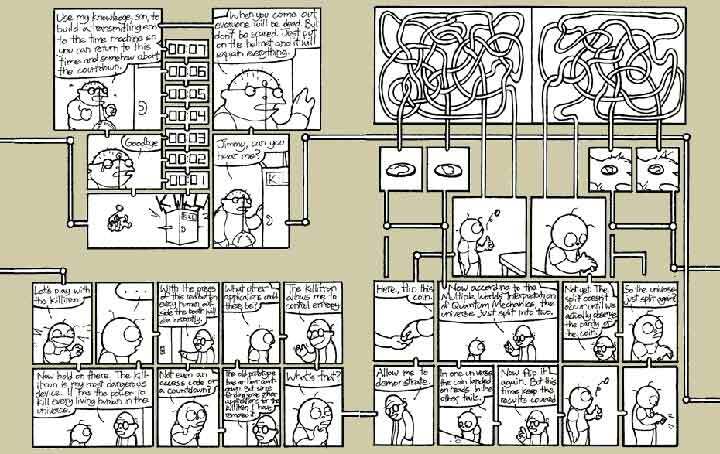 It might also be interesting to have students read the book and then visit the website, and think about the different experiences as a reader of a book and a hyper-textual comic. I would highly recommend this book for middle and high school classrooms. It's inventiveness is sure to engage thinkers of all abilities, although some younger readers may need some help with the initial navigation of the text.